The archaeological site of the Puig des Molins situated at the foot of the mountain of same name, next to the "Museu Arqueològic del Puig des Molins" (at the moment closed due to renovations), was the cemetery of Ibiza since the foundation of the city by Occidental Phoenicians at the end of the VII century BC. The initial necropolis experimented an important development in the Punic era, to be precise from the VI century BC to the end of the I century AC, reaching 50.000 square metres of occupied area. The cemetery was still used in the Roman era from the I to the V century AC and also later in the VI and VII centuries AC. The site is the biggest and best conserved necropolis of the Phoenician-Punic culture with over 3.000 Punic tombs with chamber and access well called hypogeums, although only 340 are visible from outside. 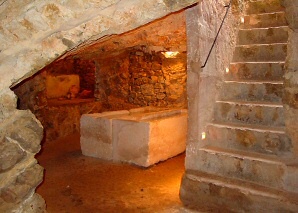 Visitors to the site can enter a group of hypogeum equipped with lights and stairs. In 1977 the necropolis of the Puig des Molins was declared a Property of Cultural Interest and in 1999, together with the fortified area of Dalt Vila, the Phoenician settlement of sa Caleta and the prairies of Posidonia of the Natural Park of ses Salines, was declared World Heritage by Unesco. Summer (from March 16 to October 15): Tuesdays to Saturdays from 10 a.m. to 2 p.m. and 6 to 8 p.m. Sundays from 10 a.m. to 2 p.m. Mondays and festivities closed. Winter (from October 16 to March 15): Tuesdays to Saturdays from 9 a.m. to 3 p.m. Sundays from 10 a.m. to 2 p.m. Mondays and festivities closed.